Did you know Texas is projected to run out of landfill space in just 56 years? That’s if we keep up our current rate of disposal—about 6.5 pounds of trash per person every day. Reducing waste is just as important as ever. Fortunately, it’s a challenge we can all do something about. Because schools accumulate tons of waste—paper, computers, books, plastics, and more—they can also be part of the effort to deal with it effectively. To help, consider starting or improving a recycling program in your school or district. There are environmental and financial benefits to starting a school recycling program. You may end up saving your school money on waste disposal costs. Some school districts have saved thousands of dollars a year by implementing recycling programs. Schools may be able to bring in additional revenue by selling recyclables that have financial value. Recycling saves natural resources and preserves landfill space. Did you know? It often takes less energy to create products from recycled materials than from virgin materials! Don’t forget, there are three R’s: in addition to recycling, it’s important to reduce and reuse, too. Schools can help the environment and their bottom line by purchasing less, buying used when possible, repairing broken items, and donating items when they’re no longer needed. We know that school officials, teachers, and parents are pressed for time, so we put together these resources to help make it easier to recycle—whether you want to start a new program or improve an existing one. 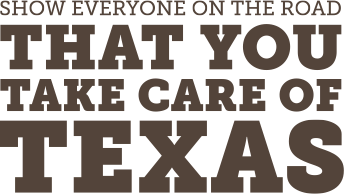 Order or download our FREE Texas School Recycling Guide. Download FREE lesson plans and discover other teaching resources on waste and recycling. Find out about recycling electronics. Share these recycling and waste reduction tips with students and educators. Check out these resources for waste reduction and recycling from the Environmental Protection Agency. 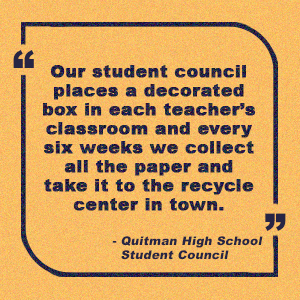 Compete against other schools in the Keep America Beautiful Recycle Bowl. To get more articles like this one, sign up for our Educator Newsletter. We won’t flood your inbox with emails—the newsletter comes out just four times a year. In it, you’ll find useful information for teaching kids about the environment, including free lesson plans and publications, articles about green classrooms and schools, ideas for service projects, and more!